You sample without replacement from the combined groups. For example, you want to choose a softball team from a combined group of 11 men and 13 women. The team consists of ten players. Each pick is not independent, since sampling is without replacement. In the softball example, the probability of picking a woman first is . The probability of picking a man second is if a woman was picked first. It is if a man was picked first. The probability of the second pick depends on what happened in the first pick. A candy dish contains 100 jelly beans and 80 gumdrops. Fifty candies are picked at random. What is the probability that 35 of the 50 are gumdrops? The two groups are jelly beans and gumdrops. Since the probability question asks for the probability of picking gumdrops, the group of interest (first group) is gumdrops. The size of the group of interest (first group) is 80. The size of the second group is 100. The size of the sample is 50 (jelly beans or gumdrops). Let X = the number of gumdrops in the sample of 50. X takes on the values x = 0, 1, 2, …, 50. What is the probability statement written mathematically? The group of interest is the vowel letter tiles. The size of the group of interest is 44. The size of the sample is seven. Suppose a shipment of 100 DVD players is known to have ten defective players. An inspector randomly chooses 12 for inspection. He is interested in determining the probability that, among the 12 players, at most two are defective. The two groups are the 90 non-defective DVD players and the 10 defective DVD players. The group of interest (first group) is the defective group because the probability question asks for the probability of at most two defective DVD players. The size of the sample is 12 DVD players. (They may be non-defective or defective.) Let X = the number of defective DVD players in the sample of 12. X takes on the values 0, 1, 2, …, 10. X may not take on the values 11 or 12. The sample size is 12, but there are only 10 defective DVD players. Write the probability statement mathematically. Let X = the number of cracked eggs in the sample of 15. X takes on the values 0, 1, 2, …, 12.
e. Let X = _________ on the committee. What values does X take on? e. Let X = the number of men on the committee. x = 0, 1, 2, …, 7. A palette has 200 milk cartons. Of the 200 cartons, it is known that ten of them have leaked and cannot be sold. A stock clerk randomly chooses 18 for inspection. He wants to know the probability that among the 18, no more than two are leaking. Give five reasons why this is a hypergeometric problem. You are concerned with a group of interest. Each pick is not independent. Read this as “X is a random variable with a hypergeometric distribution.” The parameters are r, b, and n; r = the size of the group of interest (first group), b = the size of the second group, n = the size of the chosen sample. The probability that there are two men on the committee is about 0.45. An intramural basketball team is to be chosen randomly from 15 boys and 12 girls. The team has ten slots. You want to know the probability that eight of the players will be boys. What is the group of interest and the sample? The group of interest is the 15 boys. The sample consists of the ten slots on the intramural basketball team. n ≤ r + b. The mean of X is μ = and the standard deviation is σ = . The mean of X is given by the formula μ = and the standard deviation is = . 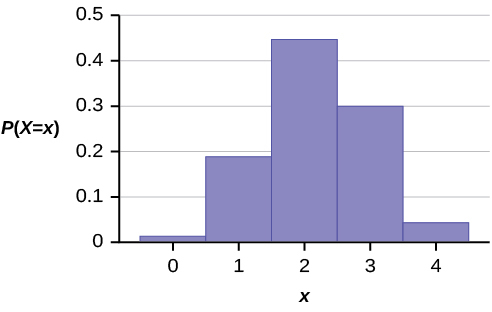 X = the number of business majors in the sample. In one of its Spring catalogs, L.L. Bean® advertised footwear on 29 of its 192 catalog pages. Suppose we randomly survey 20 pages. We are interested in the number of pages that advertise footwear. Each page may be picked at most once. Suppose that a technology task force is being formed to study technology awareness among instructors. Assume that ten people will be randomly chosen to be on the committee from a group of 28 volunteers, 20 who are technically proficient and eight who are not. We are interested in the number on the committee who are not technically proficient. Suppose that nine Massachusetts athletes are scheduled to appear at a charity benefit. The nine are randomly chosen from eight volunteers from the Boston Celtics and four volunteers from the New England Patriots. We are interested in the number of Patriots picked. Other group = hearts; there are 13 hearts in a deck. A fixed number of trials. The probability of success is not the same from trial to trial. We sample from two groups of items when we are interested in only one group. X is defined as the number of successes out of the total number of items chosen. Notation: X ~ H(r, b, n), where r = the number of items in the group of interest, b = the number of items in the group not of interest, and n = the number of items chosen. Hypergeometric Distribution by OpenStaxCollege is licensed under a Creative Commons Attribution 4.0 International License, except where otherwise noted.